Marlton, NJ – Samaritan Healthcare & Hospice’s Jewish Hospice Advisory Committee, in collaboration with Aleph Home Care, Jewish Family & Children’s Service of Southern New Jersey, Jewish Senior Housing, Jewish Sacred Aging, Katz JCC, Lions Gate, and the Tri-County Board of Rabbis, presents Embracing the Journey: Meaning, Hope and Caregiving conference on Sunday, April 28 from 8:30 a.m. to 12 p.m. at The Samaritan Center at Voorhees. Sponsored by Platt Memorial Chapels, the event is free, open to the public, and will feature a series of thought-provoking conversations on end-of-life care from the Jewish perspective. 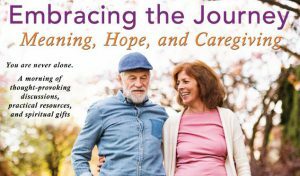 The program is designed to offer professional guidance from a variety of healthcare professionals on planning ahead for end-of-life care with family members and celebrating the journey of life through the beauty of Jewish teachings and traditions. In addition to presentations, attendees will have the opportunity to tour The Samaritan Center at Voorhees, as well as meet with local senior service professionals. The event will conclude with a spiritual ritual to celebrate life. All attendees will receive a complimentary continental breakfast. “Exploring the Challenges of Care Giving” – presentation by Dr. Stephen Goldfine, Chief Medical Officer, Samaritan Healthcare & Hospice – addressing a number of challenges as a caretaker and other considerations of Jewish traditions. “Asking the right questions” – presentation by Rebecca Rosenau, LCSW, Samost Jewish Family & Children’s Service – providing tips on how to advocate for a loved one and navigate the caregiving process. Richard Simon, Samaritan Healthcare & Hospice – offering ways to balance caretaker duties and fulfilling personal responsibilities. L’Chaim Concluding Ritual – celebrating the journey of life with Cantor Marlene Taenzer. DETAILS: Registration for the workshop is required and available onsite the day-of the event, online at www.SamaritanNJ.org or by contacting Christine Corti of Samaritan Healthcare & Hospice at 856-552-3258 or ccorti@SamaritanNJ.org.